I would very much like to know more about the history of these knives and 1 Can Para Bn. and of other surviving examples. They show up in several of the wartime photos. Were they acquired while the Bn was training at Fort Benning? I have heard that there were not enough to go around. They were more brittle than the F-S Fighting Knife, but the scabbard was more secure in my opinion. Frank Mowat carried one and lost it in battle. He then acquired a ringed grip F-S Fighting Knife and carried that in the above type scabbard. Once, when replacing it in a hurry, the blade pierced the back of the scabbard. 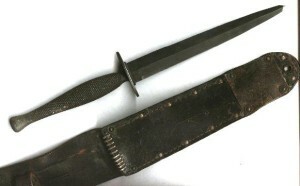 Clasp knife was standard issue for soldiers. M2 US paratrooper switchblade (issued to those who were jump qualified at Fort Benning). See the story of how one of these knives saved the life of my friend, Pte. Cliff Douglas. Lee Enfield No. 4 Mk. I* (.303″) As per rifle below, but without telescope. M1 Garand (Although the inventor was born in Canada it was not issued to 1 Cdn Para Bn. but at least one member of 1 Can Para Bn carried one. (.30/06). The M1 Garand was briefly issued to Canadian military forces late in WWII and in the mid-1950s. The Sten Mk. III was NOT carried by the 1 Cdn Para Bn. as far as I know, and probably not by other airborne troops as they usually carried the Sten Mk. II in earlier training and battles, and the Sten Mk. V on 1944-1945’s operations. The M1A1 carbine was occasionally carried but was not issued as far as we know. (.30 cal carbine). One photo has been seen of a member of 1 Can Para Bn carrying a folding stock M1A1 or M2 carbine. Vickers G. O. (Gas Operated) – This RAF/RCAF etc. weapon was used early in WWII on aircraft. It was later was used by SAS, LRDG and Airborne Recce on jeeps, and by Commando troops with a bipod in 1944. They were NOT used by 1 Cdn Para Bn. as far as I know. Boys Anti-Tank Rifle – (.55″) Probably used in early training. Projector Infantry Anti-Tank (PIAT) NOTE: PITA is the Australian designation. 17 Pounder (3″) (approximately 8.8 cm / 88 mm ) Not used at battalion level as far as I know. 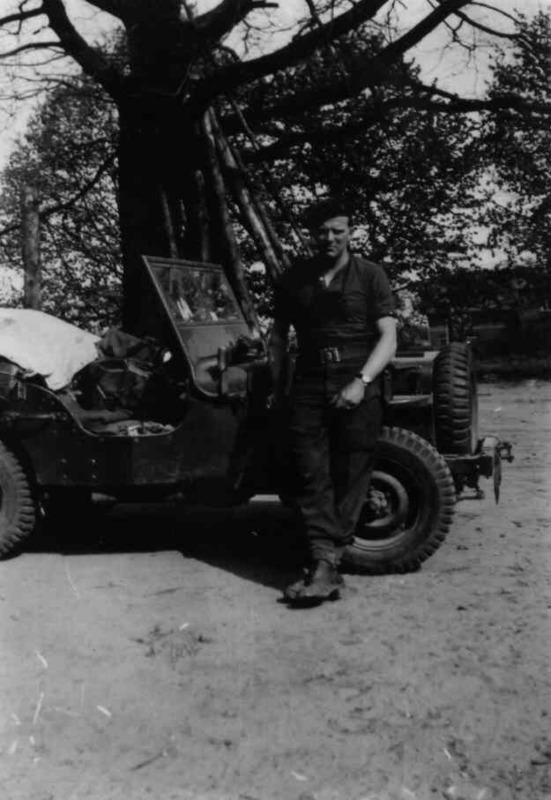 Doug Morrison standing beside an airborne modified jeep, Germany, Spring 1945. A Mo. 4 Mk. I* Lee Enfield rifle is in the weapons clips just in front of the windshield. Photo courtesy of the late Pte. Doug Morrison ex-B Coy, then Vickers Platoon of HQ Coy, 1 Cdn Para Bn. 1942-45.